As we age, our face may show the story of the life we’ve lived. Our laughter may be traced from the lines around our eyes; our confusion, with the fine wrinkles on our forehead; our puberty, with the acne scars we hide with our favorite concealers; and those summers we carelessly traipse by the beach with the marks it had left at the apple of our cheeks. We may have enjoyed the life we’ve lived and we can see it with all the marks that it left on our face, but maybe it’s time to consider keeping the memories in your head instead of wearing it in your face. Laser Skin Resurfacing, a laser treatment used to reduce facial wrinkles, acne scars, blemishes, sun-damage skin, and large pores may just be the best option for you. WHAT IS LASER SKIN RESURFACING in Thailand? Skin resurfacing may have been around for ages, and they come from more invasive packages such as dermabrasion and chemical peels. With the latest innovation in laser technology however, laser skin resurfacing was introduced to address a general number of concerns which accumulated in our face over time, and in a less invasive, more precise manner. Laser Skin Resufacing makes use of laser to send short, concentrated, pulsating beams of light against the skin therefore removing damaged skin layer by layer. The laser for laser skin resurfacing removes the top most layer of the skin while stimulating the deeper layer to produce more collagen to replace the removed skin. This specialized approach that this laser uses lessens the risk of hypopigmentation. ARE YOU A GOOD CANDIDATE FOR THE LASER SKIN RESURFACING? During your consultation with our surgeon, Prof. Somyos Kunachak will carefully examine your skin to see if you are a good candidate for laser skin resurfacing. The factors that we have to consider are your skin type, the condition of your facial skin (e.g. sun damage, pigmentation, and all imperfections). This will determine the skin resurfacing technique that will work best for you. On some cases a combination of the surgical, chemical, and laser approach is needed. WHAT CONDITIONS CAN BE ADDRESSED BY LASER SKIN RESURFACING in Thailand? Laser skin resurfacing is indicated for minor facial flaws such as fine lines and wrinkles, sun damage, age spots, warts, acne scars (not too deep), large pores, and birthmarks such as linear epidermal nevi. 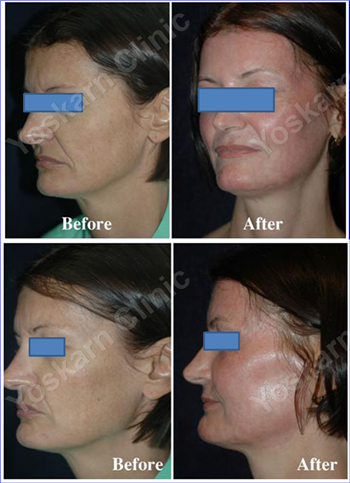 The laser treatment can also even out your skin tone and improve the texture of the facial skin. HOW IS LASER SKIN RESURFACING in Thailand PERFORMED? Laser Skin Resurfacing can be done under local or general anesthesia with some patients opting for sedation. If only a small area is to be treated, local anesthesia is possible but if the treatment will be for the whole face, general anesthesia or sedation will be the better option. The treatment can take up to 2 hours with your surgeon passing the laser beam back and forth through the area until the level is reached where the marks on the face are less visible. Your face will be left open without cover after the procedure. The skin will typically be pinkish to red with crust formation for the 1st week. This should be protected from the sun at all times. Once the crusting or scabs has fallen off, patients can start applying SPF lotion all over the area. Swelling on the face is also normal after the treatment, along with itching and stinging for the first 3-4 days but it gradually subsides. The redness or pinkness will be at maximum for the first month after the treatment but you can start covering it up with an oil-free foundation after 2 weeks. The skin tone will gradually return to normal in 2-3 months with a more radiant glow. Yoskarn Clinic offers the 3 skin resurfacing techniques (dermabrasion, chemical peel, and laser skin resurfacing) so you can rest assured that the procedure we will be recommending you will be good for you and not just because it’s the only one we have. We always make sure our clients get the treatment that is right for them as we believe that a happy client is better for us than a very busy calendar. In line with making our patient’s our top priority, we also make sure accommodation will be available for them so Aphrodite Inn offered us a floor for our patients to stay for their convenience. The hotel has an adjoining door to our center so there will be no need for patients to go out, thus avoiding the sun and also avoiding the inconvenience of travelling with bandages all over the face or all over the body. Room service is also available, with the hotel staff and our center’s nurses, doctors, and staff also available for the patient anytime.